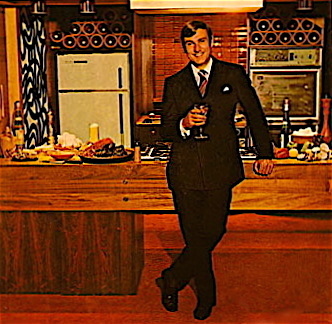 Fixing a home cooked meal for with a nice few bottles of wine can be one of the most enjoyable, romantic and delicious things to do with your woman. Find me a girl who doesn’t like a man who can handle himself in the kitchen and you can keep her. So, clean up the house, go to the butcher shop, the grocer, put on something nice and follow this recipe below to ensure a successful evening. Find a butcher that specializes in Dry-Aged Beef. It makes a huge difference in taste and is always worth the extra money. I go to the Meat Hook here in Brooklyn whenever I get a chance. Ask the butcher for a nice sized Porterhouse for two. 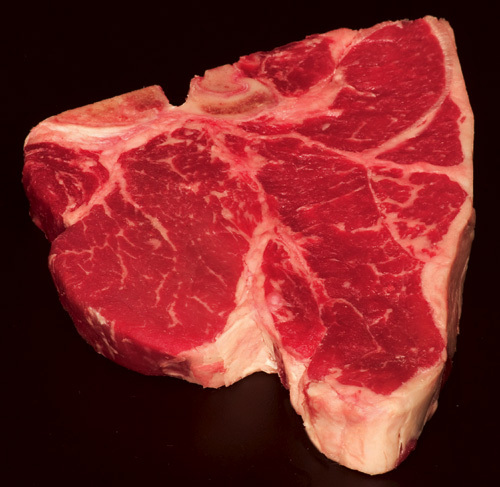 It should be around 30 to 40 oz and about an inch and a quarter thick to be considered a true Porterhouse. Otherwise its just a T-Bone steak. It has two different cuts of beef on the bone. The right side is the NY strip cut and the other is the tenderloin or filet..
Dust it pretty good with course ground sea salt and fresh ground pepper. Wrap it back up in its paper from the butcher put it in the fridge. Start with the vegetables so everything is done at the same time. You can cut the pieces big because they will be roasting for a while. You can add any other vegetables you really like carrots, peppers. Butternut squash is also really good peeled, chopped and roasted. You can even roast the seeds and throw them in a salad or eat them as a snack. Toss all vegetables in a large bowl and thoroughly cover with Olive Oil, salt and pepper. Pour the vegetables onto a baking sheet and put in a pre-heated oven at 350 Degrees for 45 minutes to an hour, depending on how crispy you like them. 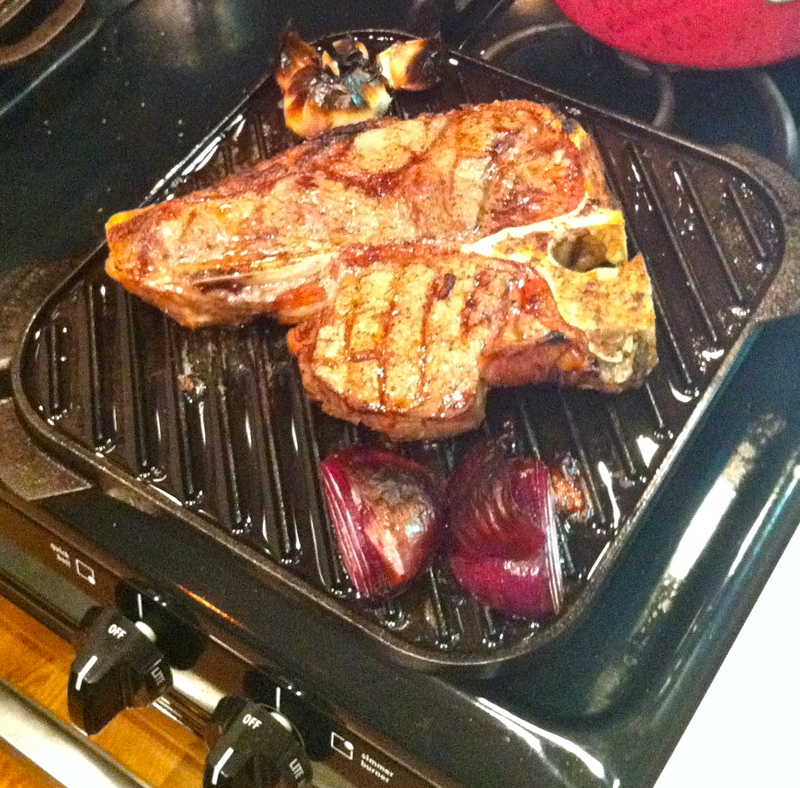 When the veggies are about 15 minutes before being done, take out the Porterhouse and heat up a large cast iron grill pan on the stovetop and turn your broiler on high. Sear both sides of the steak (about a minute on each side) then throw the whole pan into the broiler for 5 to 6 minutes on each side. A little less or more depending on your taste. When the steak is done slice and serve immediately with the roasted vegetables and a nice bottle of vino. One of my favorite wines with a porterhouse is nice Bertani, Amarone. Enjoy the meal and I hope it works as well for you as it did for me.